Have you ever been to the store and seen the teeny tiny boxes of your favorite crunchy granola? Why so small? With my crew of seven, homemade granola is the only option, else I’d go broke keeping up with our granola consumption. Plus, homemade granola is an easy recipe to twist to your own tastes. While we’re typically granola minimalists (of the dirty hippie variety), adding additional nuts, grains, seeds, or dried fruits can easily spice this granola up. I’ve been known to add wheat germ, walnuts, and sunflower seeds myself to homemade granola. I think next time, I might try adding pumpkin seeds and nutmeg (I’ve got to use the jack-o-lantern seeds for something…), or maybe a lemon or ginger version. First things first…preheat your oven to 325℉. Then in a large glass bowl, add your dry ingredients: oats, coconut, and pecan pieces (and any other dry ingredient you wish to add). Next, in a medium pot combine the ingredients to make the syrup: brown sugar, honey, salt, cinnamon, vanilla extract, and coconut oil. If you’d like to add different sweeteners, oils, or extracts…this is your moment. Be sure to keep the liquid ingredient to dry ingredient ratio pretty close to what it is in the recipe while you experiment. Heat the contents of the pot on medium heat, and stir it frequently. Once everything has dissolved, it will be a deep brown/amber syrup. While the syrup is still hot, pour it into the glass bowl containing the dry ingredients, stirring to coat. Be sure to stir several times to ensure you coat all the oats. Once you’ve successfully slathered your dry ingredients, spread them evenly onto a large baking sheet. You may need two sheets. Pop those tasty, bowel-regulating oats (shhh…like that’s not part of the reason you’re making homemade granola) into your preheated oven for 15 minutes. Take them out, stir them around, and spread evenly again on the baking sheet. Then continue to bake for another 10-20 minutes (personally, 15 more minutes is my oven’s magic number). Keep an eye on it, golden brown is an ideal color. Once it’s done, stir/toss the oats again and allow them to cool. They harden (or get crunchy) as they cool so don’t be so quick to judge them as under-baked. 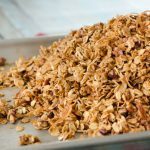 Homemade granola will surprise you with its tasty crunch after about 10 minutes out of the oven. Beware, allowing them to cool on the baking sheet un-stirred will cause scraped knuckles as you try to pry them off the sheet with your spatula (it’s like cement)…meaning stir/toss them while they’re still a wee bit softer. I like to put it in the storage container as soon as they cool enough to not melt it and shake them about to break them up. Be sure to allow the container to vent. I won’t tell you why. Hot air trapped in a sealed container with no vent is a fun, surprising experience. I won’t rob you of that. Homemade granola is fantastic on top of yogurt, eaten plain, or as cereal with milk. Let me know how you twist this recipe. I’d love to hear your variations. Crunchy homemade granola, with toasted oats, coconut, and pecans. It's great on its own and easy to add your favorite additional ingredients. Grab a large heat-safe bowl, combine oats, coconut, and pecan pieces (dry ingredients). Set aside. In a medium pot on medium heat, combine brown sugar, honey, salt, cinnamon, vanilla, and coconut oil. Stir frequently as the ingredients begin to melt, forming a syrup (about five minutes). Once thoroughly combined, carefully pour the newly-made syrup into the heat-safe bowl with the dry ingredients. Stir several times to coat (2-3 minutes). After the syrup is worked into the dry ingredients, pour the granola onto a baking sheet and spread evenly. Remove the granola from the oven and stir, then place back in the oven for another 15-20 minutes (or until it achieves a golden brown color). 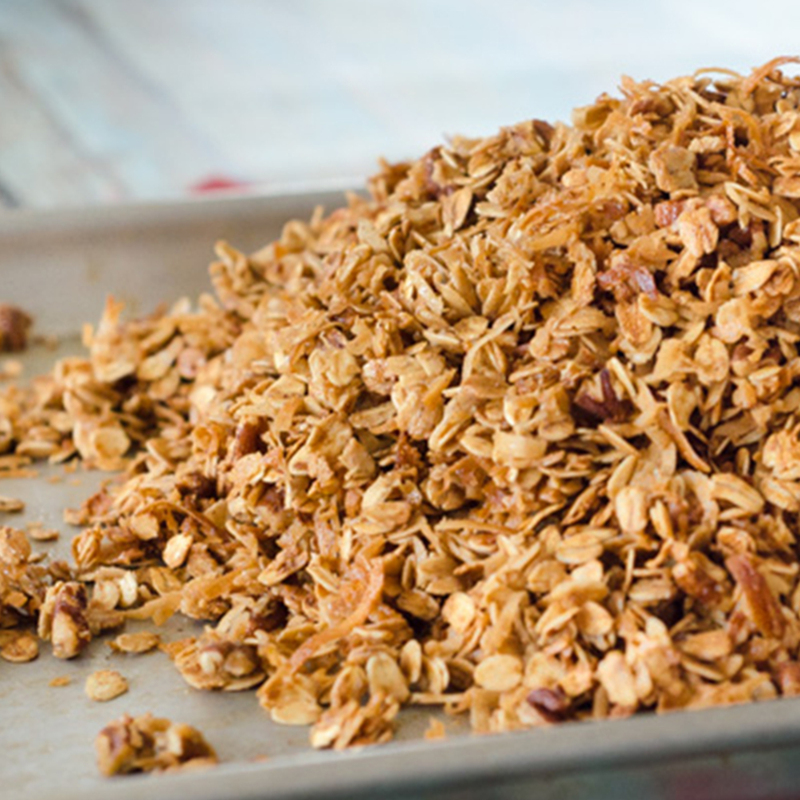 After the cooking time is complete, continue to stir the granola, removing it from the baking sheet once it has cooled. Maximum crunch is achieved after it cools. Do not over-bake the granola as it will still appear "chewy" when first removed from the oven.